When we are swimming in produce, I find a dish to combine everything we have on hand. 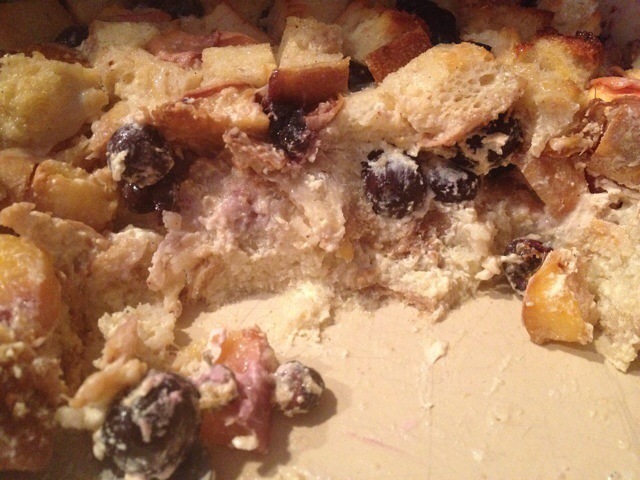 Today I have sourdough, peaches, blueberries & eggs - time for bread pudding! method: 1. Preheat the oven to 350 degrees F. Butter a 9-by-11-inch ceramic baking dish. 2. In a medium saucepan combine the butter, milk, cream, sugar, vanilla, & cinnamon, and simmer over low heat, stirring occasionally, until the butter melts and the milk is hot. Remove from the heat and set aside to cool slightly. 3. In a small bowl, whisk the eggs and then whisk them steadily into the milk mixture. Continue whisking until blended. Counting to 125 usually ensures well blended eggs. 4. Combine the peaches, blueberries, and bread in a large bowl and mix well. Transfer to the baking dish and pour the liquid mixture evenly over the top. Make sure all of the bread pieces are soaked with the mixture, and let sit for 5 minutes. Pressing down with a spatula helps here! 5. Bake for 40-45 minutes, until bubbly and brown. Serve warm but not hot. I cooled mine & served it for breakfast the next day. Not only is this a super yummy breakfast, but it's divine as dessert. Add some local ice cream from Trickling Springs and you'll want a second bowl! We are looking forward to what our CSA pick up has this week. I've had a craving for plum granita!